It’s Time for Another Giveaway: More Cookbooks!!! Crystal: Speaking of Asian, I have fallen in Korean-love with Mapilee’s Alien’s Day Out blog. She is the perfect combination of all things Asian, Arty and Vegan. My fave post of hers this week (although I am in love with all things she posts) ishttp://www.aliensdayout.com/2010/11/oh-my-life.html where she highlights the difficulty of this Vegan MoFo challenge honestly but makes up for it with so much amazing KOREAN food. Plus her rabbit bunny is sooo cute! Libby Patterson Smith: “I absolutely loved Yu Ming’s post on raw-bento about bibimbap! I just discovered her blog along with many others on the Vegan MoFo site and I cannot stop reading all of the wonderful vegan foodies’ dishes. Yu Ming has a fresh perspective and is a relatively new raw foodist and I love hearing about her experiences in Tokyo. Please email VeganMoFoBlog@gmail.com with your name and address. Thanks for commenting! Attention: Newbie vegans (think Level 1 and 2) , Asian cuisine lovers, health fanatics, cookbooks addicts, and vegans with bare shelves: 2 cookbooks are up for grabs today! Thank You to The Book Publishing Company and the authors for this donation! 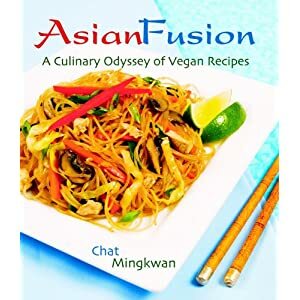 First up is another copy of Asian Fusion by Chat Mingkwan. Chat’s recipes journey from Japan, India, Laos, Korea, China, Thailand, Vietnam, Burma, Indonesia, Malaysia, Philippines, Singapore, and Sri Lanka! 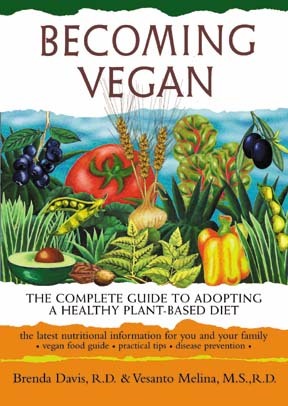 Next up is Becoming Vegan by Brenda Davis, R.D. and Vesanto Melina, M.S., R.D. Wavering on veganism? Not sure how to go about it? This book is by two experienced dietitians and discusses the health benefits of going vegan in-depth, including athletic performance and family matters. Now to enter into the contest just tell us which VeganMoFo post has made you happy this week! Post a link in the comments and tell us why you loved it, and we’ll pick two winners at random, tonight at around 4pm PST. This entry was posted in Giveaway, VeganMoFo. Bookmark the permalink. 35 Responses to It’s Time for Another Giveaway: More Cookbooks!!! The breakfast post!!! Because breakfast is the most important meal of the day and omgosh I could just eat breakfast all day long… and often do. My favorite posts always come from “Get Sconed,” this girl out of Portland. I hope I win a book!!!! Please! Keri from I Eat Trees posted a recipe for (and some droolicious pics of) peppermint stick ice cream. It filled me with nostalgia and pepperminty longing. I loved this post because I love, love, love hot chilis and just finished drying a whole bunch, then grinding them into chile powder. I can’t wait to try this tofu fajita recipe from The Airy Way. I need ways to get my son on board going veg, and everything there looks filling, and healthy! Definately the breakfast tacos from yesterday’s post. I am craving that dish! I was happy when I came across this post because it was written by another Chicago person and it was a review of the local brand of cookies I love! I absolutely loved Yu Ming’s post on raw-bento about bibimbap! I just discovered her blog along with many others on the Vegan MoFo site and I cannot stop reading all of the wonderful vegan foodies’ dishes. Yu Ming has a fresh perspective and is a relatively new raw foodist and I love hearing about her experiences in Tokyo. Oh my I just want to rub my face in this dish! as long as you’re in the U.S., you’re a winner of Becoming Vegan! please email veganmofo@Gmail.com with your name, address, win & enjoy! This bread made me happy. Amey makes me happy. Because I really have no idea how to open the pomegranate in my fruit bowel! I loved this recipe because I’m always looking for new uncomplicated weekend breakfast ideas. I often eat the same tofu scramble dish. It’ll be great to try something new! I have no idea what they’re going to taste like, but I’m pretty sure they’re going to be awesome (and pretty!). I really liked Taymer’s post about Macaroni Pie! I’ve seen non spicy versions and can’t wait to give hers a try. I love pasta, so that makes me happy! Would love to win the Asian Fusion book! I have loved some of the post from I Eat Trees in addition to that Feisty Vegan. I am a new vegan and they all have been great. How do I narrow myself to one. I Eat Trees with burgers and Potato Squashers. Dreamin’ It Vegan’s biscotti recipe makes me super happy. I’ve been craving biscotti like no other lately, so this will certainly be make very soon. Mo’s tea party post was darling! https://veganmofo.wordpress.com/2010/11/15/vegan-mofo-round-up-15-nice-as-pie-and-other-stories/ ! I mean, c’mon, Who doesn’t LOVE pie!!!! I just discovered coldandsleepy cooks this week and think that his post about market day was so extensive and well-documented, greaat food pics and great narration about his and his little tyke’s reactions to everything. I was also reminded that I looove japanese persimmons. Speaking of Asian, I have fallen in Korean-love with Mapilee’s Alien’s Day Out blog. She is the perfect combination of all things Asian, Arty and Vegan. My fave post of hers this week (although I am in love with all things she posts) is http://www.aliensdayout.com/2010/11/oh-my-life.html where she highlights the difficulty of this Vegan MoFo challenge honestly but makes up for it with so much amazing KOREAN food. Plus her rabbit bunny is sooo cute! as long as you’re in the U.S., you’re a winner of Asian Fusion! the post that made me happiest is the super fudge brownies from not a bunny. i recently have embarked on a vegan journey and the hardest part for me is baking. how will i enjoy cakes, cookies and brownies the same? i have found my answer!!! I’ve enjoyed Cupcake Kitteh’s “Eat Around the World” posts for Veganmofo. Today’s post is on food from Qatar. This post made me happy because I LOVE soup but it is difficult to find a really good cheesy or creamy vegan soup, and I can’t wait to make it with the cold months happening now 🙂 Also I love the name of the blog – Seitanic Squirrel, genius! It was soooo freaking adorable and cute! It gave me an idea for my own post about vegan honey. I loved Becoming Vegan: the authors know what they’re talking about and are not afraid to show the nutritional loopholes of veganism either.